Read the most recent press on the work of LeJeune and Associates regarding their airport concessions management program and their retail management services. On this episode of Taking Office with Chellie Cameron, Philadelphia International Airport’s Chief Executive Officer features LeJeune and Associates’ management of the airport’s food, beverage and retail operations. Listen in as Clarence and Mel discuss the evolution of their firm and the concessions program at PHL, which has been under their stewardship for over twenty years . Hear why Chellie calls them one of the airport’s most trusted partners and “the two gentlemen in charge of it all”. PHL innovates; this time with its CEO, Chellie Cameron, hosting a podcast series which gives listeners a glimpse inside one of the country’s busiest airports. Click on this episode where Mel Hannah and Clarence LeJeune joined PHL partners to discuss how they and the airport family rallied together to provide much needed and appreciated support to Federal workers during the extended Government Shutdown. Tune in for all of Chellie’s episodes at Taking Off with Chellie Cameron. Continuing their tradition of hosting successful annual outreach events that inform businesses about opportunities at the Airport, PHL held its 2018 Business Opportunity Forum on September 24th. Clarence LeJeune presented essential information about concessions opportunities at the airport and fielded questions from an audience of over 400 business and organization representatives. LeJeune and Associates has been proud to participate in this event each year make connections, encourage businesses to take part in the concessions program, and support the airport’s inclusion goals. Read more in PHL’s press release about the event. Clarene LeJeune serves as on panel with James Tyrrell (PHL Chief Revenue Officer), along with representatives from Jacobs, American Airlines, and PHL’s Engineering Division. LeJeune and Associates honors the service and sacrifices of the members of our armed forces and their families. We have been proud to support United Service Organization’s (USO) mission to strengthen America’s military service members by keeping them connected to family, home, and country throughout their service to the nation. 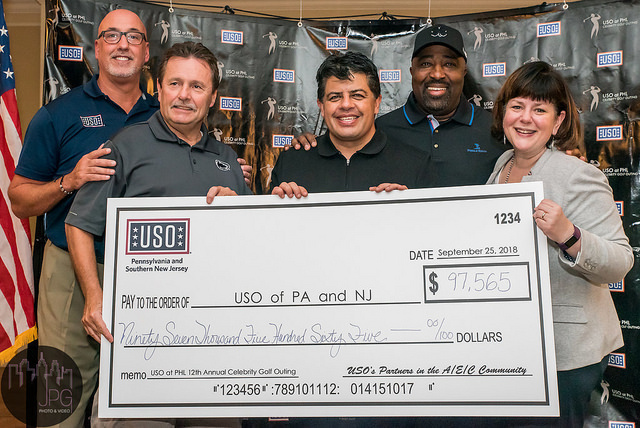 It has been LeJeune and Associates’ honor to facilitate the opening of the USO’s state-of-the-art facility early this year at the Philadelphia International Airport, and support the Annual USO/PHL Celebrity Golf Outing once again this year. Read more about the USO and PHL’s newest first-class USO lounge. Mel Hannah (Executive Vice President of LeJeune and Associates), Chellie Cameron (CEO of PHL), Joseph Brooks (President/CEO of USO of Pennsylvania and Southern New Jersey), and Clarence LeJeune (President/CEO of LeJeune and Associates) at the opening of USO’s First-Class Lounge for members of the military and their families at PHL. Joseph Brooks (President/CEO of USO of Pennsylvania and Southern New Jersey ), James Tyrrell (Chief Review Officer of PHL), Manik Arora (President/CEO of Arora Engineers), Clarence LeJeune (President/CEO of LeJeune and Associates) and Chellie Cameron (CEO of PHL) presenting the Annual Golf Outing Check to the USO. Ben’s Chili Bowl not only serves delicious, authentic American food, but is also a national treasure and historical legend in its own right. View USA Today’s feature on this renowned DC restaurant and stop by to sample some of their mouthwatering fare at Ben’s Chili Bowl in Reagan National Airport (located at the B/C Terminal Concourse Level, pre-security). If you visit their original location on U Street in DC, be sure to look for Clarence’s picture on the wall. Clarene LeJeune with owners of Ben’s Chili Bowl at their grand opening in Reagan National Airport. 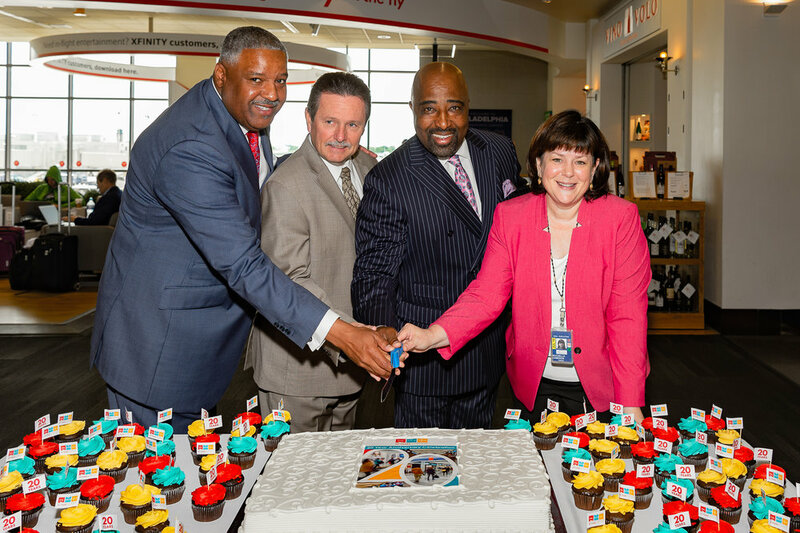 LeJeune and Associates celebrated 20 years of MarketPlace PHL at the Philadelphia International Airport on June 4. Master of Ceremonies Clarence LeJeune shared the festivities with PHL's Chief Executive Officer Chellie Cameron and Chief Revenue Officer James Tyrrell and Melwood Hannah. In addition to live music, food, and giveaways, PHL, MarketPlace, and merchant employees that had been a part of PHL's success in the concessions program for 20 years or more were honored. Clarence LeJeune, President of LeJeune and Associates represented the firm at the Airport Minority Advisory Council's (AMAC) March 20-21, 2018 Leadership Summit in Washington, DC. A long-time supporter of AMAC, LeJeune and Associates attends this annual event to network with peers, industry leaders, and government representatives; advocate for more opportunities in aviation; and serve as an information resource for elected officials. Mel Hannah, Vice President of LeJeune and Associates, led MarketPlace PHL's team to victory in the 10th Annual Ronald McDonald House Plane Pull fundraiser held on May 5, 2018. Under his leadership, Mel's team accelerated against worthy challengers, pulling the plane in the fastest time. This was not only a friendly competitive victory, but a triumph for the Ronald McDonald House, which supports families of seriously ill children while they are undergoing treatment. LeJeune and Associates' efforts helped raise nearly $170,000 for the organization at this event. PHL's Annual JobFair highlights open jobs and career potential that the Airport has to offer. It attracts thousands of job seekers each year. Because concessions represents one of the largest employment pools at the airport, LeJeune and Associates coordinates MarketPlace PHL's participation in the planning for the events, ensuring that tenants maximize the benefits of the JobFair and preparing tenants for the event. A critical event leading up to the JobFair is the Employer Breakfast, where employers seeking employment candidates at the JobFair are given sage advice, interviewing tips, and engagement strategies. LeJeune and Associates played an important role again this year, when Mel Hannah not only spearheaded efforts to get maximum tenant participation at the JobFair, but anchored the concessions discussion at the Employer Breakfast. More than 50 businesses exhibited at the 2018 PHL JobFair, the majority of which were in the MarketPlace PHL family. The Philadelphia International Airport (PHL) has developed an award-winning Airport Concessions Disadvantaged Business Enterprise (ACDBE) program with the assistance of Marketplace PHL, its concessions management business partner. The Office of Property Management and Business Development has a concessions management contract with Marketplace PHL, a joint venture between Marketplace Development Inc. and LeJeune and Associates, to operate the concessions program at the airport. Marketplace Development is a Boston-based airport concessions development and management firm operating in several U.S. airports, while LeJeune and Associates is a Philadelphia-based DBE firm that specializes in airport concessions operations management. LeJeune and Associates (LeJeune) is a certified DBE firm and has a 30 percent stake in the joint venture relationship. Much of the day-to-day administration work with ACDBE firms is done by LeJeune, who is responsible for managing the daily operations of the PHL concessions program. "Our role in the Marketplace PHL joint venture is to manage the daily concession operation," said LeJeune president Clarence LeJeune. "Our background is retail operations management and we have moved into airport concessions management with this opportunity." LeJeune manages the leasing operations, design and construction of concessions, merchant compliance, security, outreach and compliance with the ACDBE program. Website for LeJeune and Associates, LLC, a food, beverage, and retail management firm.